Caption: (l-r) Perry Baltimore, President of The Marshall Legacy Institute, Stanley Brown, Director of U.S. Department of State’s Office of Weapons Removal and Abatement, G. Lincoln McCurdy, TCA President, H.E. Jadranka Negodic, Ambassador of BiH, Ajla Delkic, Executive Director of ACBH. 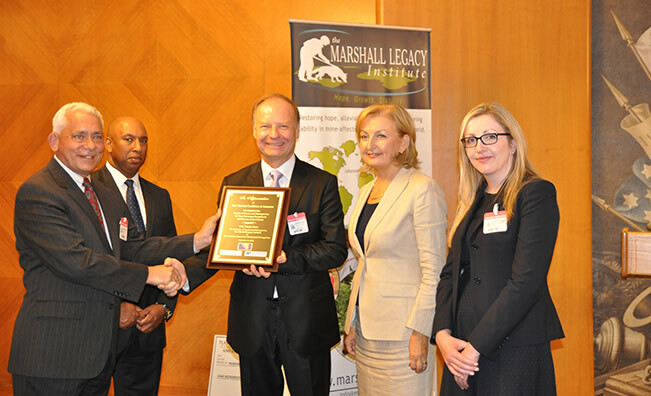 On September 17, the Turkish Coalition of America (TCA) presented a donation of $ 100,000 to the Marshall Legacy Institute (MLI) to aid flood relief and demining programs in Bosnia and Herzegovina (BiH). The TCA grant to the Marshall Legacy Institute's Bosnia programs will be fully matched by the U.S. Department of State. MLI is a U.S. nonprofit organization that was formed in 1997 to extend the vision of Nobel Peace Laureate George C. Marshall by alleviating suffering and promoting hope, growth, and stability in war-torn countries. For many nations, a primary obstacle to achieving sustainable progress is the deadly legacy of landmines. MLI’s primary mission is to establish practical, affordable, and sustainable indigenous programs to help severely mine-affected countries rid their land of the horrific scourge of landmines. 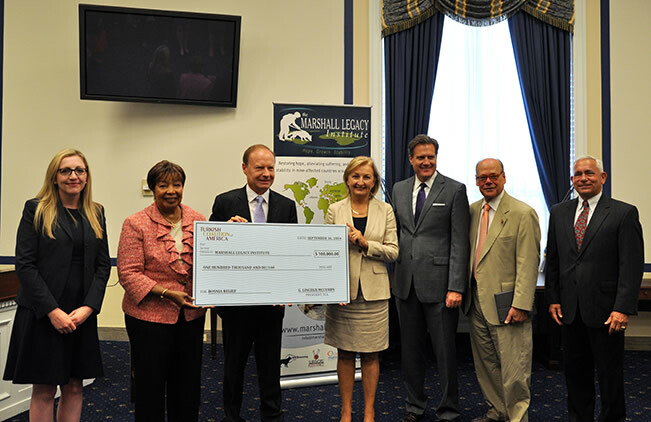 TCA's donation was recognized at two events hosted by the Advisory Council for Bosnia and Herzegovina (ACBH), the Embassy of Bosnia and Herzegovina, and MLI at the U.S. Congress and the U.S. Department of State. The TCA grant aims to help BiH recover from the recent devastating floods that not only caused substantial damage throughout much of the country, but also caused a serious setback in demining efforts by displacing countless landmines and washing away mine warning signs. “Nineteen years after the war, BiH remains the most mine-contaminated country in Europe as landmines continue to threaten communities. MLI has worked in BiH since 2004, donating 28 lifesaving mine detection dogs and providing prosthetic limbs and vocational training to dozens of landmine survivors. We are extremely grateful to TCA for supporting this very important cause,” stated H.E. Jadranka Negodic, BiH Ambassador to the United States. "As the Co-Chair of the Congressional Caucus on Bosnia and a member of the Turkey Caucus, I am happy to be here today to honor the Turkish Coalition of America. It is of extreme importance that all of us work together towards a mine-free Bosnia, and I am glad that TCA is taking part in this fight,” stated Congresswoman Eddie Bernice Johnson (D-TX). Joining Congresswoman Johnson in recognizing TCA were members of the Congressional Caucus on Bosnia and the Turkey Caucus, Congressman Michael Turner (R-OH), and Congressman Steve Cohen (D-TN). TCA has been a long-time supporter of the Bosnian American community through multi-year grants extended to the Advisory Council for Bosnia and Herzegovina and by sponsoring congressional visits to help enhance awareness about the country and region in Washington, DC. Caption: (l-r) jla Delkic, Executive Director of ACBH, Rep. Eddie Bernice Johnson, Co-Chair of the Bosnia Caucus, G. Lincoln McCurdy, TCA President, H.E. Jadranka Negodic, Ambassador of BiH, Rep. Michael Turner, Member of the Bosnia Caucus, Rep. Steve Cohen, Co-Chair of the Turkey Caucus, Perry Baltimore, President, The Marshall Legacy Institute.